I'm converting my Series 100 "Grand Hikari" from Kato. 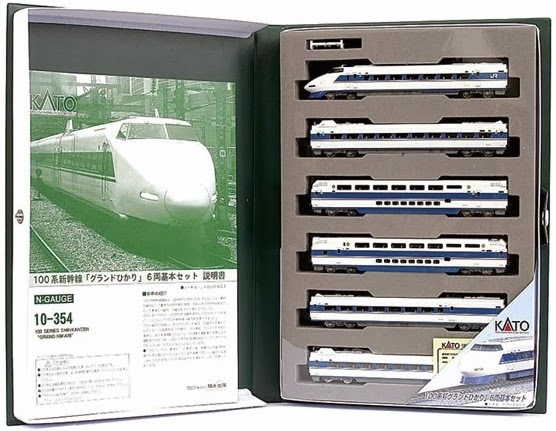 It's a six cars set with the reference number 10-354. Cab and end car, two double decked cars, and two normal cars, one of them motorized. The motorized car is really easy to convert to DCC, very similar to most of the other Kato motorized cars. I used a Digitrax DZ125, just for motor control, so the other wires have been cut. I'll also install interior lighting, but I've decided not to use decoders and wire lights directly to feeders. Yes, interior lighting will be always on, but I have always the lights on, so it's a waste of money all the decoders needed for all cars in my different sets. So every set will only have one decoder for motor drive, and two more cheap decoders for cab and end car to manage the directional lights. But I'll show you the lighting install later, now the motor cab. Easy and straight. Red and black wires to any point of the brass strips, and orange and gray to the motor reeds. Normally this motor brass reeds or flaps are in contact with the long brass strips that feed the current from the wheels. I just used a small piece of isolating tape in the back of the motor reeds, where normally are in touch with the feeder strips. There is enough space at the end of the car for this decoder, and it's not seen because in this end side there are no windows, just one too small to see inside. I'm sorry but this post is as short as easy. There are better ways, hiding the wires under the seats, but for that other thinner wires should be used, or closing the model would be a bit difficult. Kato's motor cars have no enough room under the seats for wires unless you change decoder's wires or you be quite rude to close it and fit the canopy again.